The drug works very quickly, within 48 hours — a significant improvement over currently available antidepressants, which can take two to four weeks to have an effect, if they work at all. “Postpartum depression is a serious condition that, when severe, can be life-threatening,” Dr. Tiffany Farchione, acting director of the Division of Psychiatry Products at the Food and Drug Administration’s Center for Drug Evaluation and Research, said in a statement. There are limitations to the new drug, brexanolone, which will be marketed as Zulresso. It is delivered by infusion over 60 hours, during which a new mother must remain in a certified medical center, under supervision should she get dizzy or faint, as several patients did in clinical trials. The infusion will be expensive, averaging $ 34,000 per patient before discounts, according to Sage Therapeutics, the manufacturer. That does not include the costs of staying in a medical center for two and a half days. Company officials say they expect that insurers will cover the treatment; insurers said this week that they are evaluating the drug. A pill made with a similar molecule, which would be much more accessible and easier for patients, is showing promise in its clinical trials and would be submitted for approval in a couple of years if the results are good, according to Sage. The infusion is to be administered just once, and patients may also take standard antidepressants. Clinical trials of the drug, all sponsored by Sage, found that it produced a steeper decrease in symptoms in women with severe and moderate postpartum depression than a similar placebo infusion. The relief from depression continued for a month after the treatment. While there were anecdotal reports that it extended beyond that period for some women, there has not been systematic research on longer-term results. “The major thing is, of course, the rapid effect,” said Dr. Margaret Spinelli, a clinical professor of psychiatry at Columbia University, who treats and studies postpartum depression and was not involved in the research on brexanolone. 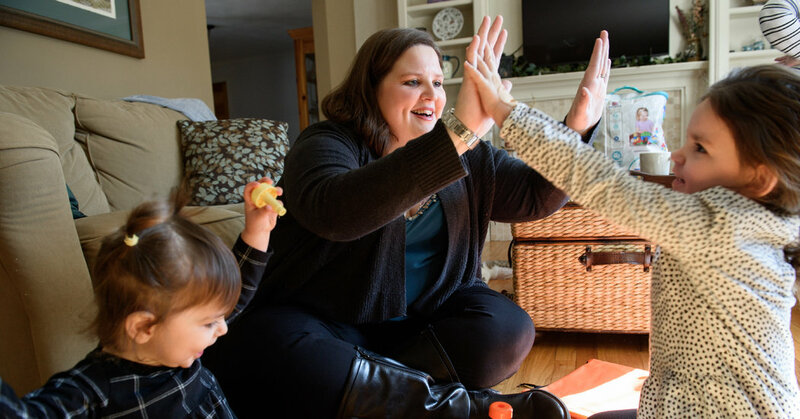 “That it’s the first that’s designed for postpartum depression is important and means it will probably be a segue to design other medications for postpartum depression to be administered in an easier way,” she added. The treatment may be helpful for up to 30 percent of the 400,000 American women who develop postpartum depression each year, said Dr. Kimberly Yonkers, a professor of psychiatry, obstetrics, gynecology and reproductive sciences at Yale, who was not involved in the research. Candidates for treatment would likely be those experiencing severe symptoms or who failed to improve on standard antidepressants, said Dr. Yonkers, who was not involved in the research. “This brings up a lot of very complex public health issues,” she added, noting the expense of the treatment and the need for patients to be admitted to medical centers. “It may be worth it, if somebody has been treatment-resistant or they can’t wait the two to four weeks for an antidepressant to kick in,” Dr. Yonkers said. “Depression can be pretty miserable,” she added, harming the entire family. Brexanolone is a synthetic form of allopregnanolone, a hormone produced by progesterone in the brain that may help ease depression and anxiety by dampening neural activity, said Dr. Samantha Meltzer-Brody, director of the perinatal psychiatry program at the University of North Carolina at Chapel Hill, who was the principal investigator for the brexanolone studies. The research presented to the F.D.A. consisted of three clinical trials that were led by Dr. Meltzer-Brody and funded by Sage Therapeutics, which was also involved in the study design, data analysis, interpretation and writing of the reports. The trials involved 247 women randomly selected to receive a placebo or brexanolone — a relatively small number of participants, compared to many other medical trials. Still, the results were considered persuasive by a joint F.D.A. advisory committee last year, which recommended approval in near-unanimous votes. The women in the trials had given birth within six months of getting the infusion and were experiencing severe or moderate depression that had started in the third trimester of pregnancy or within four weeks after childbirth. Participants could not have psychosis or bipolar disorder. Their symptoms could include suicidal thoughts but not a recent suicide attempt. They were asked to stop breast-feeding during the infusion and for a few days after. But Dr. Meltzer-Brody said the drug appears safe for nursing mothers and babies, because very little of it seeps into breast milk. Depression improved in the women receiving brexanolone and in those receiving placebo, a phenomenon common in studies of depression treatments. But more women in the brexanolone group showed improvement, and their improvement was more substantial. In one trial, severely depressed women started with scores of about 28 out of 30 on the Hamilton Depression Scale, a standard evaluation tool. After the infusions, the placebo group averaged about 14 while the brexanolone groups averaged at 9 or 10. A person with a score of 7 or below is considered to be virtually without depressive symptoms. About twice as many women on brexanolone achieved that status, Dr. Meltzer-Brody said. After a month, more brexanolone patients managed to keep depressive symptoms at bay, compared to those who received placebos. But in a study of moderately depressed women, those receiving placebos reported feeling as good as the brexanolone patients after 30 days. That may mean that standard antidepressants finally began kicking in, Dr. Spinelli said. Or perhaps the subjects simply improved on their own. “We’re going to have more data to understand what happens in a larger population after 30 days,” Dr. Meltzer-Brody said. Dr. Jonas said the experimental pill, given for two weeks in the clinical trials, seems to offer the same benefit as the infusion. It is being tested for treatment of major depression in addition to postpartum depression.